Dr. Prashant Jani completed his MBBS (1994) and MD (1997) from Pune University, India. He then migrated to Canada and completed a residency in Anatomic Pathology, and FRCPC, from the University of Toronto, Ontario, Canada (2001-2005). He currently works as an Anatomic Pathologist Thunder Bay Regional Health sciences Centre and Northern Ontario Cancer Research Centre, Thunder Bay, Ontario, Canada. He also is the Associate Professor, Northern Ontario School of Medicine, Ontario, Canada. He has also been on the faculty on the Cancer Pathology Course, in Thunder Bay, Ontario. He is a dynamic pathologist with more than 15 years of experience. His special interest is Oncopathology. He is founder of International society of Oncopathology.He continues to visit Pune every year, conducting a International Oncopathology CME in Jan of each year, which is very well attended by 350 Pathologists from all over India. 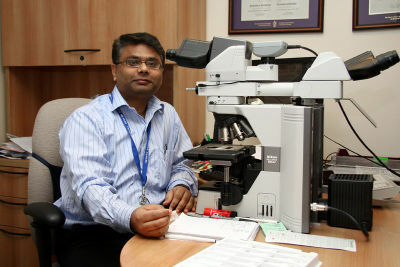 He is also founder of International reference center for cancer Pathology- OncoPath Diagnostics, India. This is India's first International reference center with Digital scanning system.The center provides international consultation to the patients in India- at no extra cost !!! He is active member of United states and Canadian Academy of Pathology meetings, and has many platform presentations and posters to his credit. He has published many papers in international journals. Dr.Jani has been awarded Lorraine Dougal award by Association of Indian Pathologists in North America for his outstanding contribution to Pathology services in India. Anatomic Pathologist, Thunder Bay Regional Health sciences Centre and Northern Ontario Cancer Research Centre, Thunder Bay, Ontario, Canada. Associate Professor, Department of Pathology and Laboratory medicine. Northern Ontario School of Medicine. Ontario, Canada. 06/1997 –02/1998-Cytopathologist, B.J. Medical College, Pune, India. 01/1994 –12/1997-Blood Transfusion Officer, Red Cross Blood Bank, Pune,India. 1) D-240 expression on luminal surface of pulmonary airspaces in normal developing and adult lung but is lost in conditions associated with intra alveolar infiltrates. Presentation at American Society of Clinical Pathology, Nov.2005, Chicago, USA. Prashant Jani,Abdel Walkett and Hong Chang,Am J Hematol.2007 Jan;82(1):73-6. 3) CD 138 expression in Merkel cell carcinoma: A potential diagnostic pitfall in hematological malignancies. June, 2006, Toronto, Ontario, Canada. Presentation at annual meeting of Canadian Association of Pathologist, June, 2006, Toronto, Ontario, Canada. Prashant Jani, D.El-demallawy, The Canadian Journal of Urology, 2007 Jan;56(11):933-50. 7) An approach to duodenal biopsies. Review article. Prashant Jani, Charles Ye, Nov.2007,Journal of Clinical pathology. diagnosis, immunohistochemical evaluation, and review of the literature. Jani Prashant; Chetty Runjan; Ghazarian Danny M. The American Journal of dermatopathology 2008;30(2):174-7. 10) Comparative analysis of CD 56, calretinin, and inhibin immunohistochemical staining in the diagnosis of ovarian granulosa cell tumors. Faculty and Course coordinator,Practicing pathologist association meeting, ,B.J Medical College, University of Pune, Maharashtra, India. Faculty , Northern Ontario Cancer Research Foundation meeting Ontario, Canada. course co-ordinator and faculty at B.J.Medical College and Sasson Genreal hospitals, Pune, India. 8) Seminar – Cancer Biology 5th Jan.2011 at Lakehead University, Thunder Bay, Ontario, Canada. 9) Seminar -“Colorectal Cancer- guidelines for margin and lymph node dissection.” 19th Jan.2011 at B.J.Medical College Pune, India. 10) Seminar-“Role of Immunohistochemistry in Breast Pathology” 20th Jan. 2011 at Bharati Vidhyapeeth Medical College, Pune, India. 11) Course Director- Surgical Pathology Update, Jan 26th 2011 at Ahmedabad Medical Association, Gujarat, India. 12) Seminar – “ Work up of Carcinoma of Unknown Primary”- 15th Feb.2011 at Bharati Vidhyapeeth, Pune, India. 13) Seminar – “Her2/neu and Breast Cancer” , May 21, 2011, Teleconference with University of Texas Health Science Center at San Antonio, USA. American Society of Clinical Pathology. College of Physicians and Surgeons of Canada.